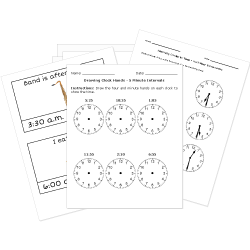 Use these time worksheets to encourage student learning of reading clocks, telling time, and calculating elapsed time. Worksheets labeled with are Common Core Standards aligned and accessible to Pro subscribers only. Become a Subscriber to access all standards aligned worksheets. Don't see a printable you need? Use our Test Maker™ to create your own printable that fits your needs. Browse time questions or calendar math questions or use our advanced search to find existing questions while filtering by grade levels and keywords. Related Lesson: Telling Time - A.M. and P.M.
Estimating Time - Hours or Minutes? Time - A.M. and P.M. Clip Cards - A.M. or P.M.?